Categories: 'Name on a Shelf' Print, All Prints. 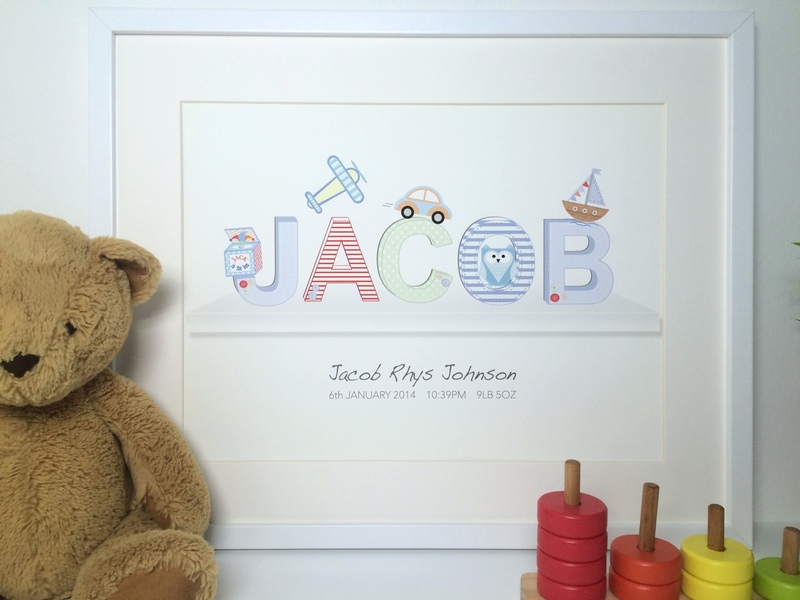 This lovely personalised ‘name on a shelf’ print is a beautiful addition to our ‘Little Letters with Love’ Alphabet collection. 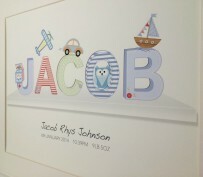 This print features a corresponding picture nearby each letter, from our original alphabet pictures. eg. A is for Airplane, B is for Boat, C is for Car. Pictures for each letter of the alphabet have been designed based on some of life’s most recognised words for children to recognise and learn. Not only beautiful but educational too! In the case of a duplicate letter in a name, a different colour of the relevant picture will be used, so no picture in one name will be the same. Displaying your choice of first name, in capitals. The letters in this design have the look of lovely fabric 3D letters sat upon a shelf, with extra attention to detail such as,the look of little buttons and fabric stitching. Below the shelf you can personalise your print further with a message of your choice, such as, a child’s full name and capturing the momentous occasion of their birth, with their date, time and weight details(as shown). Each print will be one of a kind! Perfect as a new baby, christening or birthday gift for a little one’s bedroom or nursery. 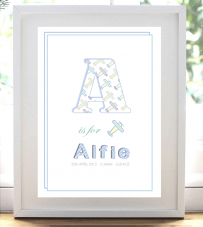 Beautifully displayed on a bedroom wall alongside one of our Full Alphabet prints. 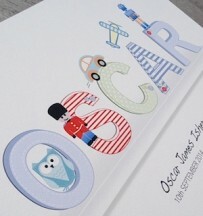 Printed using 100% Epson inks, on the highest quality, award winning, fine art archival matte 210 gsm paper. Producing art, in a superior gallery and museum standard. Creating lifetime quality!